Pick up Hex-Logic Hand Applicator Pads when polishing hard-to-reach spots and small isolated areas. Hex-Logic Hand Pads are perfect for polishing and removing swirls, scratches, and paint transfer from wherever a machine polisher just won’t fit. Door handles, trunk jambs, window sills, wheels, exhaust tips, and foglights can now be polished without a dual action polisher or rotary buffer. These hand-held polishing pads use the same premium pad foams, Hex-Logic grooves, and distinct foam densities as the Hex-Logic Machine Polishing Pads. When Hex-Logic engineers were designing the best pattern to evenly spread polish across the work surface, they drew inspiration from nature. Bees instinctively build their honeycombs with hexagonal chambers: the most efficient shape for dividing any given space into an even grid. When polishing compound is spread over the hexagonal chambers of a Hex-Logic pad, the hexagon grooves ensure the best spread for even paint removal and fast and efficient polishing work over any painted surface. 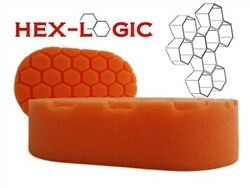 Use the Orange Hex-Logic Hand Polishing Pad to remove swirls, scratches, oxidation, and paint transfer from painted surfaces in and around any automobile. The Hex-Logic Hand Polishing Pad is perfect for removing fingernail scratches from the back of door handles where no machine polisher can fit. Follow up with the White Hex-Logic Hand Applicator Pad to refine away any compounding marks, then spread a coat of protective wax with the ultra-soft Black Hex-Logic Hand Pad. When a machine polisher is out of the question, choose the Hex-Logic Hand Polishing Pad from Chemical Guys. Wash the surface to be polished with preferred Chemical Guys car wash soap or waterless car wash solution. Use a clay bar to remove any above-surface contaminants. Work the polish into the surface to rub the particle abrasives over the affected paintwork. Work a spot no larger than 1 square foot. Follow up with lighter polishes on White Hex-Logic Hand Applicator Pad, then glaze/sealant/wax with the Black Hex-Logic Hand Applicator Pad.